Bright Green custom t-shirts are a new option from shirt manufacturers. These are high visibility with a shade that is completely new. They make a great option for schools, field trips, and summer camps. They are also a good option for outdoor businesses looking to gain a marketing edge with a catchy shirt color. Talkingink custom t-shirts prints a lot of field trip t-shirts for schools. Their purpose is to have a highly visible shirt so they can see everyone in their group easily at one time. 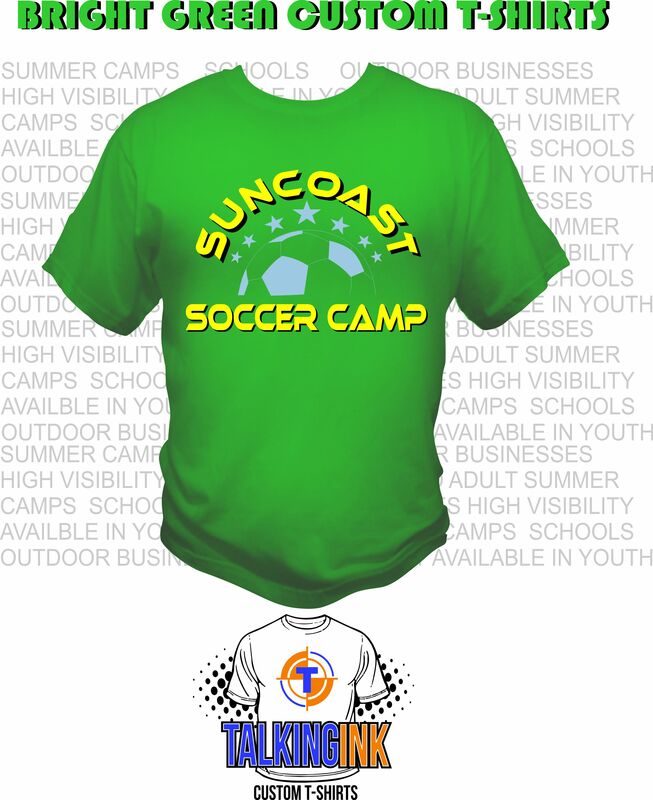 Bright green custom t-shirts achieve that goal and since they come in both youth and adult sizes make a great choice. It’s a shirt color we push because it’s a newer color but provides all the aspects field trip organizers are looking for. In addition to field trips they make a great option for schools in general because of their unique shade. It’s a very vibrant color that accepts several complimentary ink colors. Orange, blues, white, greys, other shades of greens make great complimentary ink options so in addition to having a visible shirt you can have a uniquely colored design. When it comes to outdoor businesses where OSHA approved shirt colors are not required, bright green custom t-shirts make a great option because they it’s an eye catching color. So the marketing aspect of a bright green shirt gaines you an advantage over other companies traditonal grey or solid colored shirts. Matching company shirts provides some professionalism to a business and piggy backing marketing off the shirt color is a no brainer. If your mowing lawns in a neighborhood you most certainly want to have everyone coming and going seeing your shirts. The bright green custom t-shirt provides that recognition.